There was some leftover appam batter and we both love appam any which way. I had recently done a post on sun dried tomatoes and there was a discussion on my facebook page whether they can be used to make sambars and rasam. Why not? The way I sun dry the tomatoes, they are not flavored or seasoned so one has all the liberty to use them in any cuisine and dress up the recipe with unique flavors. So being summers we don't much like sambars if it is not a dosa idli party that we used to do some years ago. For those parties there used to be a lot of sambar, 2-3 types of chutneys and all possible variants of idlis, vadas and masala dosa. Now I wonder how I used to manage all that. Now I look for easy options and cook for just the two of us most of the times. Anyways, I decided to use sun dried cherry tomatoes for a simple no fuss stew for this appam breakfast. It took just 10 minutes to cook. I used pearl onions (baby onions) for this stew and peeling them can be time consuming, I get it done by the maid sometimes and keep a bag of it in the fridge. So it was easy. Make the paste and keep aside. Heat the oil in a pan and tip in the halved pearl onions and curry patta and give it a quick stir for a couple of minutes. Add the paste, stir for about a minute, add a cup of water ans simmer for 5 minutes. You can add some coconut milk in the end, but it's not required if you are not looking for a milky creamy color. 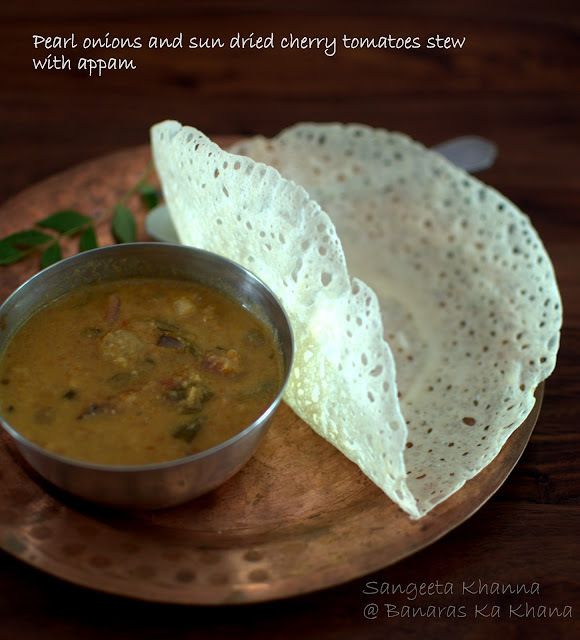 This stew goes really well with appams. Nice deep flavors, sun dried cherry tomatoes lend enough tartness and the flavors are all very rounded with so many different spices used. Perfectly crisp appams or plain dosa is perfect with it. This is so quick it was a week day breakfast for us. Yes I had most things ready in the fridge but still the things were cooked freshly.